This article will address what I consider to be the central question on the issue of music for ballet class: Can music for ballet class impact how effectively your students perform each exercise, and how they evolve week to week as dancers? It’s an important question and one that needs to be discussed. As the equipment for home recording became less and less expensive and more powerful, more musicians began to record and release music online and the result has been an enormous amount of music for ballet class available for download. The web also made it possible to cheaply publish music, which has turned out to be a double edged sword. On the one hand it enables the largest number of people to find an audience for their music but as a recording engineer and pianist I’ve seen a negative side to this ease with which music can be recorded and released and it has affected the quality of music for ballet class as well. There is a psychology that was always present in the recording studios back when it cost a lot to use one; One always came in prepared and always made sure the material and the ability to play it was the best it could be. Now that you can just click the mouse on your laptop and start recording and what that means, in many ways, is the pressure is off. This reality is readily apparent if you start digging through the volumes of music for ballet class now available online. 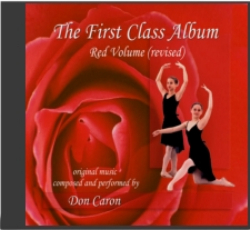 In spite of the large volumes of music for ballet class that is available it is harder than ever to find high quality material for class. There is a longstanding disagreement that exists about the use of classical standards in ballet classes, and both sides have good points. My position on it is that the better the composer/pianist understands the classes and what is required of the students the more equipped that composer is to provide high quality music for ballet class, music that will be far more effective than transcriptions and adaptations. I prefer music that is crafted, structured and honed for each specific ballet exercise. There are a number of reasons for this. Foremost, the music really does have the ability to improve the learning process. Many teachers use it as a pleasant and somewhat inspiring timepiece, but when music for ballet class is created by an individual who understands the muscular and psychological tension and relaxation that the students are experiencing, it can be a powerful player in the class. It brings up a question which is not often heard in any discourse on music for ballet class: Can the music that you select for your classes impact your ballet students’ progress, how effectively they perform each exercise and how they evolve week to week as dancers? The answer to that question is most certainly a yes. 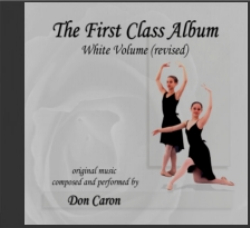 In the 1980s Ballet Instructor Elizabeth Carlssohn and composer Don Caron conducted a series of informal studies while working in the Eastern Washington University Dance Department. What they discovered was a clear link between the level of performance proficiency in the dancers and the music being played. They experimented with beat placement, musical character, beat width, phrase shaping and melodic manipulation. 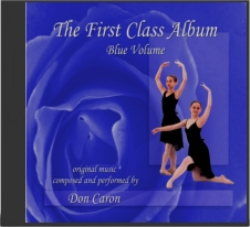 The results of their efforts was formulated into a system known as The Motosonus Method which is used in The First Class Albums—Music for Ballet Class, composed and performed by Don Caron and produced by Elizabeth Carlssohn. In this series each exercise is crafted specifically for the ballet movements that it accompanies. The simplest example of how this works to create powerful music for ballet class is the use of beat width and beat placement. There are lengthy discourses written on this subject, but for the sake of brevity just think of a musical beat as space in which a note can be placed, a space that we’ll refer to as the slot. It’s actually not an exact location in time, but an area that provides a width for the note placement. By using this to advantage a pianist, playing music for ballet class, can push the beat and make it wide to create a feeling of expansiveness and lift; He can pull the beat and make it narrow to give the music a sense of drive and make it sound faster than it is; He can place the beat in the exact center of the slot and make the music metronomic, reliable and safe. These are only a smattering of examples and there are numerous ways to employ the manipulation of beat width and placement to create music for ballet class. The same came be done with phrasing and melody. These refinements and codifications are a natural progression of music for ballet class. Top level teachers in ballet have always sought out the best live, improvised music they can find and many of the best teachers in the world express a preference for a pianist that improvises over one that plays transcriptions. Since that’s not an option for every studio, we do need recorded music for ballet class. But there’s a world of difference in effectiveness from one musical artist to another. If you can locate a composer whose music resonates with your teaching and who employs some of the techniques we’ve discussed here you will find that it will make an enormous difference in the progress of your students.